Stroll through the beautiful gardens of Ravello’s Villa Cimbrone where you can relax and linger over outstanding views of the Amalfi Coast and Bay of Salerno. Celebrated for its fine views, Ravello is one of the most popular travel destinations on the Amalfi Coast in southern Italy’s region of Campania. 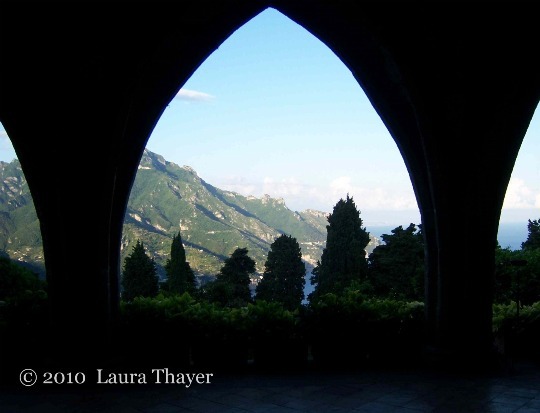 The town of Ravello stretches out along a promontory that seems to have been perfectly designed by nature. On one side the mountain valley runs down toward the seaside town of Atrani and on the other Minori, and the views are stunning in every direction. Located at the tip of the promontory is a lush, green area, where you can just glimpse a Greek temple peeking out between the trees and the very tip of a turreted tower to tempt your gaze. 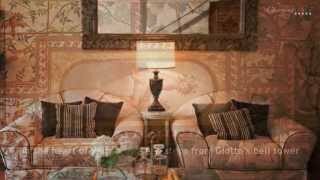 This is the Villa Cimbrone. 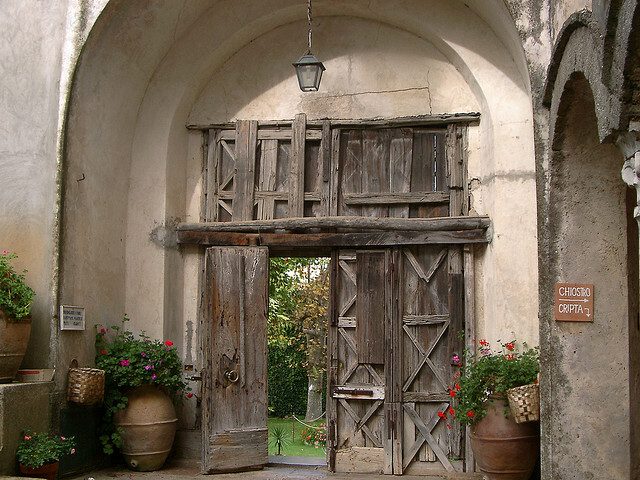 Entering through the old wooden doorway, it feels like you’ve slipped into a hidden garden. This grand estate was owned by wealthy, noble families in Ravello during the Middle Ages and was treasured for its dominant setting and fertile soil for farming. 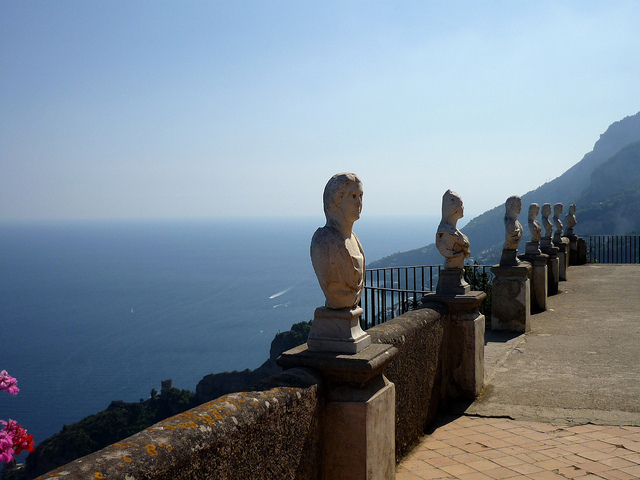 By the end of the 19th century the Villa Cimbrone was essentially abandoned when it was rediscovered by the Englishman Ernest William Beckett, Lord Grimthorpe, while he was traveling on the Amalfi Coast. Touched by its latent beauty, he purchased the estate and gardens in 1904 and set to work turning it into the beautiful gardens you can visit today. The names of the pathways through the gardens are almost as evocative as the views along the way. Upon entering, your eye is drawn down the long and straight Avenue of Immensity toward a temple with a statue of the Ceres, the ancient Roman goddess of harvests. Stroll along the grand pathway under wisteria and a the pretty stone bridge, all the while being teased by brief glimpses of the bright blue sky and sea beyond. Just on the other side of the Temple of Ceres awaits one of the most beautiful panoramas on the Amalfi Coast. With a straight drop down just beyond wall lined with 18th-century marble statues, this beautiful overlook is very aptly called the Terrace of Infinity. If you’re feeling brave, step onto the semicircle balcony where looking out all you can see is sky and sea. 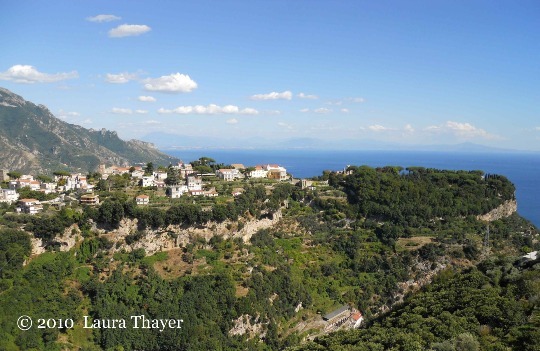 From here you can see the Bay of Salerno and the mountainous coastline as it drops down to the Mediterranean Sea. It’s hard to pull yourself away from the intense views on the Terrace of Infinity, but there are many other treasures to discover while exploring the gardens. Located on a little terrace surrounded by cypress trees you’ll spot what looks like a Greek temple. While inspired by classical architecture, the Temple of Bacchus was built in the early 20th century for Lord Grimthorpe and features a bronze statue of Bacchus. It was in this intimate spot that Lord Grimthorpe requested for his ashes to be buried after his death. Take your time to explore the Villa Cimbrone gardens, which are a wonderful blend of English and Italian landscaping traditions. The gardens are dotted with marble and bronze statues in beautiful settings and many unique architectural styles blended together. 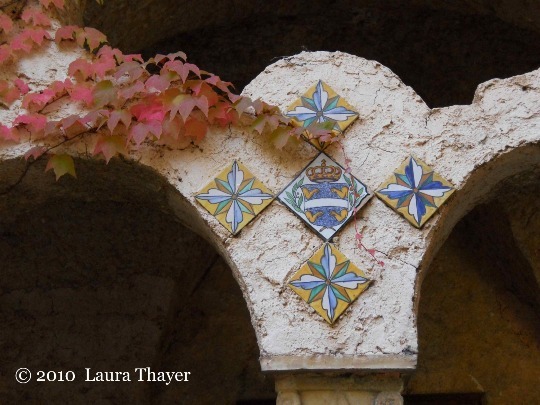 Before leaving the gardens, visit the cloister with its beautiful arches and architectural elements reflecting Arab, Sicilian and Norman styles from the Middle Ages. Follow the narrow staircase down to the crypt, an open gallery with Gothic vaulting and arches that look out over the Amalfi Coast. The gardens are at their most beautiful in the spring and summer, but it is also wonderful to stroll through the Villa Cimbrone in the autumn when they are touched with red, gold and yellow hues. During the winter months, when the air is clear and crisp, the views are extraordinary and the grounds are covered with wild cyclamen. 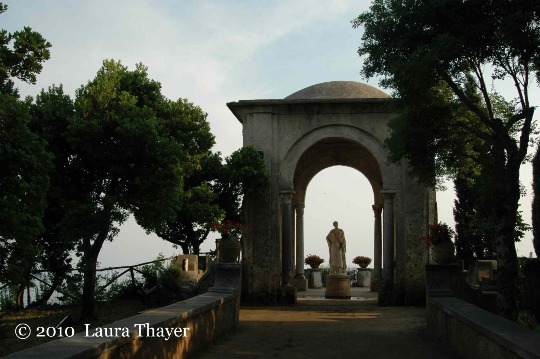 No matter the time of year you visit Ravello, the Villa Cimbrone is one of the peaceful treasures of the Amalfi Coast. Hi Roger, thanks for your passionate comment! 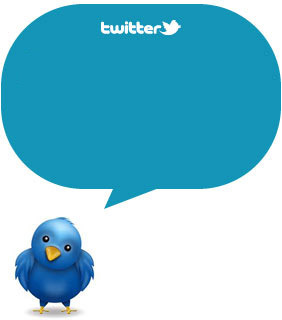 We are very pleased that the post of Laura has caused these positive feelings in you! So very happy you enjoyed the post of the Villa Cimbrone, Roger. 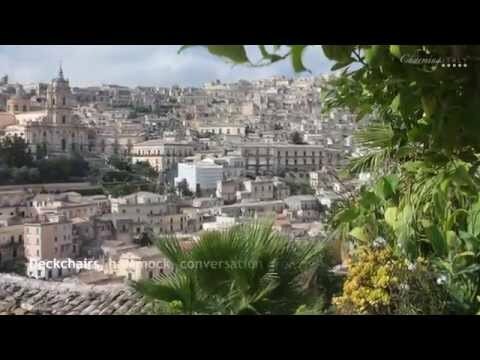 It is one of my favorite spots on the Amalfi Coast to go and get away from everything! 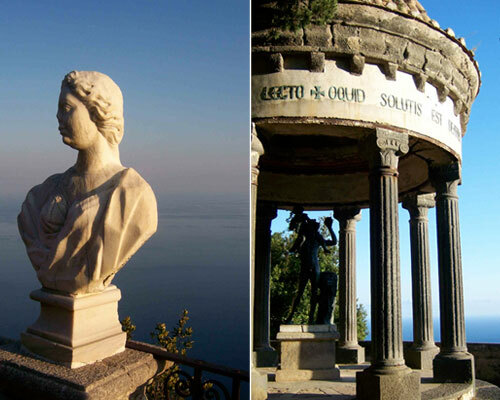 the gardens cimbrone,is magnificent anda place to admire the tremendous view's of the bay of salerno, the bay of naples and beyond. the silence and the gardens are an unforgetable experience and the walk there from the square is hard but the gardens and views are worth all the effort of getting there.A WOW FACTOR EXPERIENCE,JUST LOVE THE PLACE ,WONDERFUL,a place to linger and unwind in perfect peace.my shangrila.